Everyone loves a good summer road trip, but heading off into the sunset can be more stressful than you might imagine, especially if you are traveling with young children in tow. The farther you are going to be driving, the more potential there is for something to go wrong, so you will want to take as many steps as possible to prepare yourself for the trip. Even if your vehicle is in good working order, it’s always a good idea to have a tune up before heading off on a long adventure. Have an oil change, make sure your tires are properly inflated and check your wiper blades, coolant levels and transmission fluid. Depending on the climate of the area you will be driving in, you may also want to have your air conditioning system recharged, because no one will be happy if it gives out while driving in 90-degrees plus weather. It may seem harmless to have a beer or two while stopping at a restaurant for lunch, however, even a few drinks can impair your judgment, slow your reaction time and make you less capable of doing the right thing during an accident. Your vacation is meant to be fun-filled, not filled with the worries of an out-of-state DWI. If you are pulled over for impaired driving, you need to seek legal counsel and be aware that it’s not the end of the road. According to Evan Levow, a New Jersey DWI attorney, “People mistakenly think that nothing can be done to defend against a DWI charge. That’s incorrect. The same goes for driving while tired or emotionally upset. Driving sleepy can be almost as dangerous as driving under the influence. Take a break and rest your eyes, even if only for 30 minutes. If the kids are making you crazy, stop for a few minutes, get some fresh air and resume the trip when you feel calm and centered. Planning ahead can make the trip more fun, and it can also save you a lot of time and energy if something goes wrong. Map out your route and mark down emergency facilities along the way, such as hospitals and auto repair shops. It’s always a good idea to keep an emergency kit in your car. Include things like first aid kits, tools and roadside flares. Make sure that your cell phone is fully charged before you leave on the trip, and if your phone doesn’t come with a camera, keep one in the car so you can take pictures in case of an accident. If a crash does occur, be sure to write down the names, addresses, license plate and phone numbers of everyone involved. Taking a road trip with your kids is a great way to create memories that last a lifetime. Unexpected situations may come up, but if you come prepared and face them with a positive attitude, you will be able to manage these untimely events. If nothing else, a difficult situation can be viewed as an adventure, and going through something like that will only deepen the bond between you and your family members. 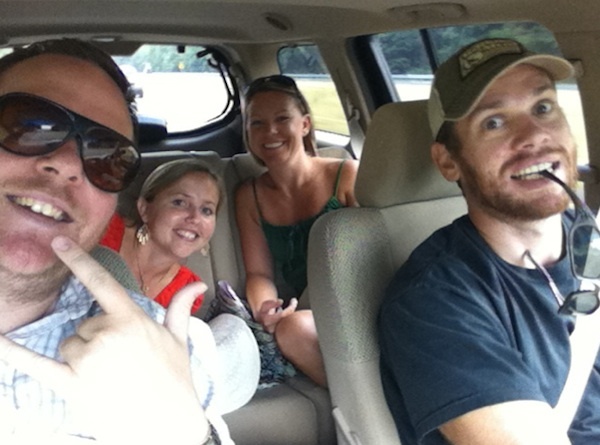 Nadine Swayne loves a good road trip and writes this article for fellow travelers. If you get sidetracked and are facing DWI charges, Evan Levow, a New Jersey DWI attorney, will aggressively fight for your rights by using innovative DWI defense strategies for your case. Mr. Levow is one of only five attorneys in the state of New Jersey qualified to instruct field sobriety testing. Making sure that the car is tuned up is a very good idea because I did not do this one time, and the car broke down. I always make sure now to have the car serviced before going on a road trip. Not driving mad or upset is a very good idea because you can get in a terrible accident. I like to go on road trips. Thanks for the tips. The iPads and DVD players work awesome for us to avoid the kids getting bored. I used to like to follow along on the maps too. AAA has Triptiks which are kinda fun for kids, at least I LOVED them! Yes, AAA is my best roadie friend! Must have DVD players to keep kids from getting bored on long trips. Great tips! We just finished a 12 hour drive today, and one tip is if you listen to the radio to look up stations online for the cities you are going through for the music you like! Ok .. that one I am definitely using for my next trip! great tip! Definitely do not drive drunk! Ipads are a must have for our roadtrips! Thankfully our road trips never last longer than 5hrs. I’m not sure how families do cross country trips because even our shorter trips are more than enough for my sanity! Thanks for the tips! We have a road trip coming up next week so perfect timing!